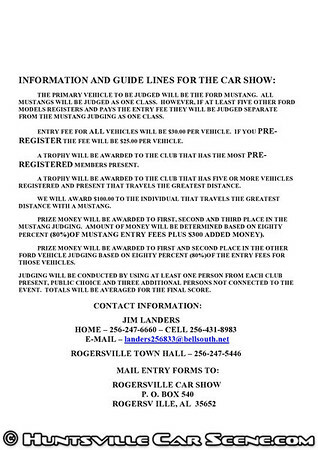 The primary vehicle to be judged will be the Ford Mustang. All Mustangs will be judged as one class. However, if at least five other Ford models register, they will be judged separate from the Mustangs. Registration is $30 per vehicle and ends around 10am, $25 pre-register. 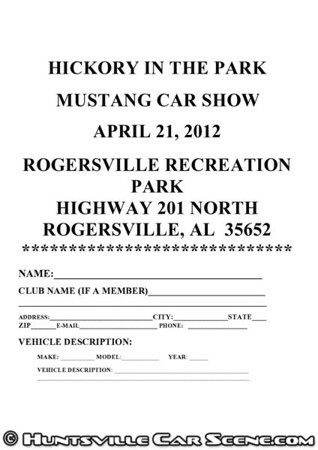 Registration is open to Mustangs and other Ford vehicles. This event is held in conjunction with a BBQ contest and Bluegrass music festival with several bands on the lineup, so there should be plenty to do. This is a family friendly event with games for children. There is no alcoholic beverages allowed in the park.